(SPOT.ph) After the merriment of the holiday season, the Social Security System implemented the increased contribution rates! Hurrah! If you’re feeling a bit unaccomplished (even though you’re unemployed), cheer up. Your taxes paid for mansions and parties, and as a bonus, you’re also now part of the movement to save a dying institution! In various interviews, SSS President and CEO Emilio De Quiros repeatedly stated that the SSS is not sustainable in its current state. It is now neither social nor secure, it’s just a plain system-and not a very good one at that. Current members who are receiving their pension are disgruntled over the laughable sum that they receive, which is made worse by poor service and delays. To change things, the SSS board is taking several steps to steer it in the right direction...and they are giving themselves about P10 million as a bonus for their good work. Confused yet? Here are some answers to questions you may have about the higher SSS contribution rate. 1. Why are we paying more? Simplest answer: The SSS is running out of money to pay for its accountabilities to its members (in the future). Due to an estimated P1.1 million unfunded liability, SSS will eventually "completely consume" all of its funds by 2041 (or 2038 or 2039, depending on which statement you come across). The 2041 estimate is according to the President’s State of the Nation address in 2013, in which President Aquino also hinted at the change in the SSS Pension Scheme. 2. What is an unfunded liablity? Simplest answer: Future debts, which cannot be paid based on the value of current assets. The amount, at any given time, by which future payment obligations exceed the present value of funds available to pay them. This means that at the rate that the SSS collections are going, a number of people will not receive the benefits that they are paying for (in the future) because there will be no funds for it. Think of the SSS as a "multilevel marketing" scheme, where (there should be) a steady stream of money coming in as the youth get employed and are enrolled in the system, while members of the older generation retire and enjoy their pension. The money is indeed invested somewhere but the interest rate from the "meager sum" is not enough to finance all the benefits that SSS promises. With the current rate of unemployment and the fact that a portion of the working population are OFWs (remember: they can choose not to pay SSS fees), it is obvious that there will be a deficiency even if everyone is paying what they should at the current rate. Throw in delinquencies and mismanagement in the mix and you get bankruptcy. 3. How much is the increase? The SSS has released an official table to let the people know what the 0.6% increase looks like for them. The second column shows the Monthly Salary Credit or the MSC, which has also increased from P15,000 to P16,000. This means that on top of the 0.6%, SSS will also be computing the contribution from a larger portion of people’s salary. An employee earning P14,750 (and above) previouly paid P500 of the P1,590 total contribution to SSS. In the current scheme, an employee with a salary ranging from P14,750 to P15,249.99 will now pay P545 of the P1,680 total contribution to SSS. An employee who earns something between P15,250 to P15,749.99 will now pay P563.20. If you’re earning P15,750 or more, you will now be paying P581 in SSS fees. 4. Are we paying for the unfunded liabilities? Simplest answer: Not in its entirety. As reported by GMANews, SSS President and CEO Emilio De Quiros stated that the increase in contribution rate will reduce the unfunded liablity by 15% (or P166 billion). This will also extend the Social Security Fund by four more years, says De Quiros. 5. Why are they getting millions in bonus when the SSS has all that shortfall? Simplest answer: Because you know...reasons. The news of the P10 million bonus that SSS board officers received in 2012 was not met positively by people, especially after they announced the (now implemented) increase in SSS fees. In addition to the P10 million bonus for each person in the SSS board, a total of P276 million was also given to other SSS employees. 6. Can we do something about this? Simplest answer: We can try. Bayan Muna Representatives Neri Colmenares and Carlos Zarate petitioned for a probe into the SSS Bonus Scandal, stating that the board members do not deserve a pat on the back for their performance as it is, in a manner of speaking, poor. 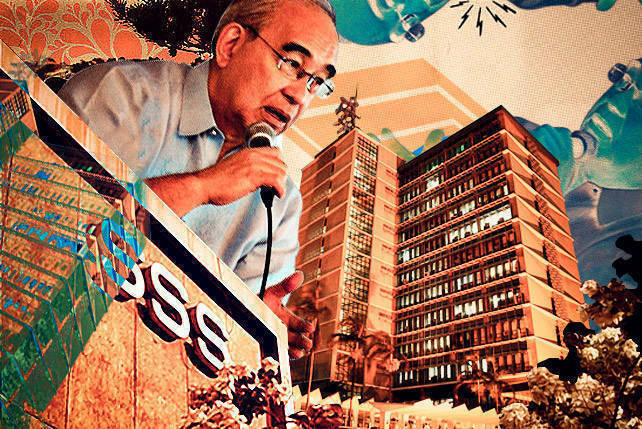 The lawmakers elaborated on the failure of the SSS board but the probe has yet to be conducted. 7. What the bloody hell are they doing in SSS? Last year, SSS extended its arms into the household by enrolling maids into the system under the KasambahayLaw. They are also planning on selling about P20 billion in assets, starting with prime property it owned in Bonifacio Global City, which sold for P2 billion. They also had a brief moment of alleged heartlessness when they announced that 65-year-old members will only be given pension if they completed the 120 monthly contribution to SSS. Those who do not meet this criteria were to be given a lump sum (their total contribution plus interest) but, for "humanitarian reasons," the ruling was revised in order to accommodate older members who are willing to voluntarily continue their payment. 8. Why on earth would they deprive people of their own pension? De Quiros explained the priority at the moment is protecting its diminishing funds and that it would be unwise to dole out money to members who did not complete their payment. Representative Simeon Datumanong called De Quiros "harsh" and he further criticized the mismanagement of the SSS. Back in 2012, Datumanong also supported a call for SSS to refund the excess fees that it collected. In a letter to The Philippine Star dated September 11, 2013, the SSS stated that their actions are logical and that "there is no basis for a refund." 9. Does this mean that there will be more rate increases in the future? De Quiros stated that in order to reach the international standard of 70 years or perpetuity, the rate of contribution should be at 14 percent. With the increase, the current rate is at 11 percent. 10. Can you make this sound any simpler? Essentially, the SSS wants to increase the contribution rate because it can’t pay for future benefits. But here’s where it gets confusing: De Quiros and other board members are getting fat bonuses for "good performance" in generating income, but they’re also claiming that SSS is going bankrupt (which is also why they are selling assets to further decrease the unfunded liabilities). We must be missing something here.